The morning was soft and cloudy—but only for a while. By 10 am, the sun was blazing and having its usual relentless way with Penangites. Perhaps as many as 20,000 of us were already gathered outside the Dewan Sri Pinang, where the body of one of Penang’s most beloved sons had been lying in state since 8am that Sunday, 20 April 2014. 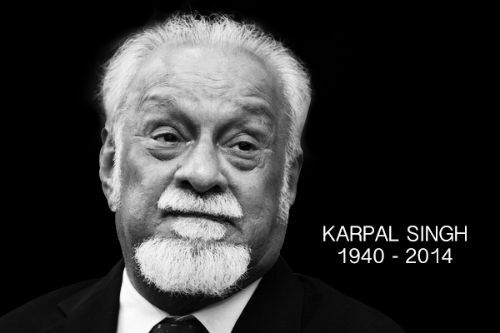 Karpal Singh, respected lawyer, fiery Member of Parliament for Bukit Gelugor and foe of countless bigots is no more. He was killed in a traffic accident on the North-South Highway in the first hour of 17 April. Huge throngs of people who three days later lined the streets around the State Assembly Hall, the courts and St Xavier’s Institute to wave goodbye and to shout “Karpal Singh” one last time, following thousands of others who had over the two nights before the funeral visited his family home in Western Road to pay their respects. Many made the trip from as far away as Johor to join fellow countrymen and countrywomen to publicly moaned Karpal Singh, and who felt that this was the least they could do for a man whose fighting spirit had always been inspirational. We should certainly pause and ponder why so many Malaysians and Penangites felt such a strong need to come together. I am sure there are a whole range of reasons, but chief among these has to be the iconic status achieved by the man. He had simply come to symbolize the stand against bigotry and abuse of the law which the country has been suffering from for so long. His belief that respect for the law is the necessary foundation for a just society and for protection of human rights was something that has had immediate appeal to people of all classes. His bravery in speaking back to arrogant power, and the directness of his words carried immediate appeal in a society given to hushed compromise and feudal diffidence. These values held so strongly in him certainly resonated well in Penang, whose people struggles to consider itself liberal and modern. In all ways, Karpal Singh was indeed a true son of Penang – he represented Penang values with great ease. In fact, he amplified them more loudly than anyone else. In that way, perhaps his persona as an activist lawyer was what endeared him to common folk more than his role as bold politician. But once that is said, it does seem trivial to even try to separate the different parts of the man. He was in the thick of so many battles over the decades, and he was in the consciousness of Malaysians for such a long time, that he was in truth simply “Karpal Singh”, the one and only, irreplaceable and unique. He will be sorely missed. Looking back, we find solace in the fact that his sturdy example inspired so many young people that we know for sure that Malaysia would have been a worse place without him. The Tiger of Jelutong may roar no more, but I certainly hear the roll of that thunder amplified in countless hearts. Whether that echo will grow in volume depends on new champions of the values he represented so excellently.